The joint system would have created the largest hospital system in Texas. Memorial Hermann Health System and Baylor Scott & White Health have canceled plans for a merger previously expected to create the largest health system in Texas. 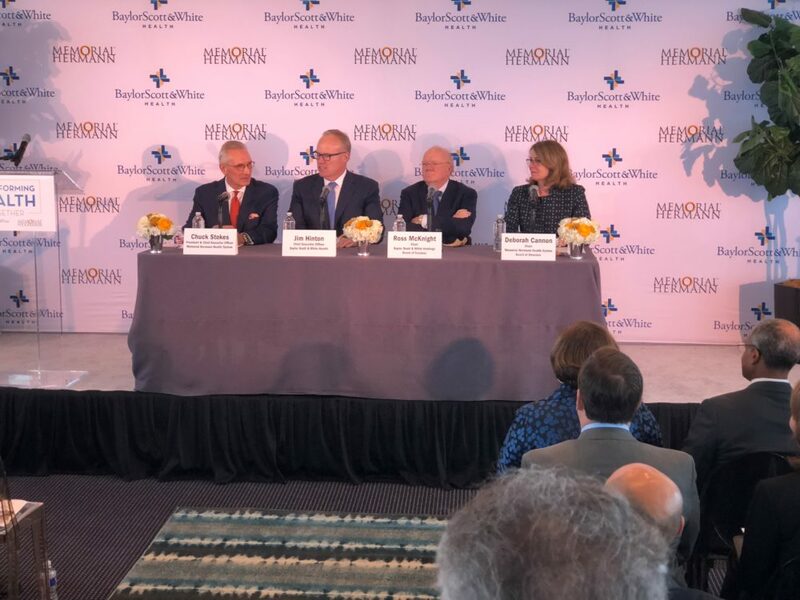 From left to right: Chuck Stokes, president and CEO of Memorial Hermann; Jim Hinton, CEO of Baylor Scott & White Health; Ross Mcknight, chair of Baylor Scott & White Holdings Board of Trustees; and Deborah Cannon, chair of the Memorial Hermann Health System Board of Directors, during a press conference held in Houston on Oct. 1, 2018, to announce the merger. Both systems announced plans to combine their boards, leadership teams, and operations in October of 2018. The move would have created a system of 68 campuses employing 73,000 people in Texas in more than 30 counties, the hospitals said. While heralded as efficient and cost-effective by the leadership of both hospitals, news of the merger renewed criticism of large hospital systems, whose critics say costs to patients tend to rise when hospital systems consolidate. “The resulting increase in market power means that the hospital doesn’t have to pass any cost savings on to the customer,” said Vivian Ho, a healthcare economist at Rice University. News of the merger’s cancellation comes as a relief, she said.